We are successfully meeting the varied needs of our patrons by offering a wide gamut of HNBR O-Ring as per their precise needs. With an objective to fulfill the ever-evolving demands of our clients, we are engaged in offering a wide assortment of HNBR O Rings. We offer HNBR O-Ring. Manufactured using premium grade Hydrogenated Nitrile Butadiene Rubber (HNBR), our O-rings offer excellent pressure resistance capacity. 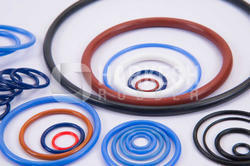 Our O-rings are characterized by heat resistance, oil and chemicals. These are widely used where high pressure is the common norm such as in hydraulic cylinders. Hydrogenated Nitrile is a synthetic polymer that results from the hydrogenation of nitrile rubber (NBR). Not compatible with : Chlorinated hydrocarbons, Polar solvents (ketones, esters and ethers), Strong acids. Leveraging over the skills of our qualified team of professionals, we are instrumental in offering wide range of HNBR Rubber O Ring.